Arts therapy taster sessions have been trialled at Harcombe House, where beneficiaries were invited to start by simply making marks on a page and seeing where it took them. 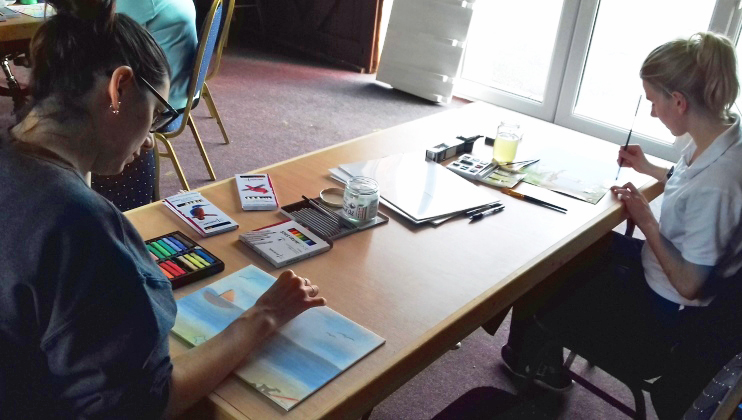 Seven beneficiaries who recently attended the Health and Wellbeing programme at Harcombe House became the first to take part in an innovative art therapy trial, led by Art Psychotherapist Daisy Rubinstein. While introducing the session, she explained the nature of the trial; to find out whether art therapy would be something attendees would appreciate or find helpful as part of their programme, and that it was a safe space for any and all expression that came to them. Daisy will be running further arts therapy sessions over the coming weeks and inviting more beneficiaries to join her.